AWS Direct Connect links your internal network to an AWS Direct Connect location over a standard 1 gigabit or 10 gigabit Ethernet fiber-optic cable with one end of the cable connected to your router, the other to an AWS Direct Connect router. Direct Connect connection can be established with 1Gbps and 10Gbps ports. Speeds of 50Mbps, 100Mbps, 200Mbps, 300Mbps, 400Mbps, and 500Mbps can be ordered from any APN partners supporting AWS Direct Connect. AWS Direct Connect helps to create virtual interfaces directly to the AWS cloud for e.g, to EC2 & S3 and to Virtual Private Cloud (VPC), bypassing Internet service providers in the network path. AWS Direct Connect location provides access to Amazon Web Services in the region it is associated with, as well as access to other US regions (in case of a Direct Connect in a US region). for e.g. , you can provision a single connection to any AWS Direct Connect location in the US and use it to access public AWS services in all US Regions and AWS GovCloud (US). Each AWS Direct Connect location enables connectivity to all Availability Zones within the geographically nearest AWS region. All data transferred over the dedicated connection is charged at the reduced AWS Direct Connect data transfer rate rather than Internet data transfer rates. Direct Connect can be easily scaled to meet the needs by either using a higher bandwidth connection or by establishing multiple connections. A VPC VPN Connection utilizes IPSec to establish encrypted network connectivity between your intranet and Amazon VPC over the Internet. VPN Connections can be configured in minutes and are a good solution for immediate needs, have low to modest bandwidth requirements, and can tolerate the inherent variability in Internet-based connectivity. VPN connections are very cheap ($37.20/month as of now) as compared to Direct Connect connection as it requires actual hardware and infrastructure and might go in thousands. 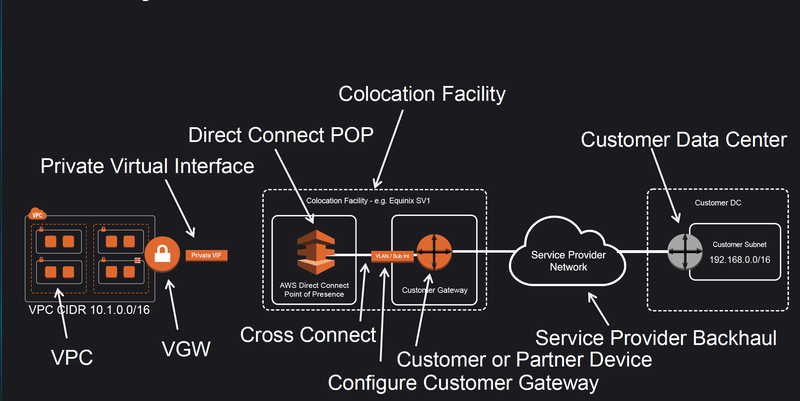 Connection between the AWS Direct Connect PoP and the Customer gateway within the Colocation Facility is called Cross Connect. Once a Direct Connect connection is created with AWS, a LOA-CFA (Letter Of Authority – Connecting Facility Assignment) would be received. Each AWS Direct Connect connection can be configured with one or more virtual interfaces. Public Virtual Interface can be created to connect to public resources for e.g. SQS, S3, EC2, Glacier etc which are reachable publicly only. Each virtual interface needs a VLAN ID, interface IP address, ASN, and BGP key. To use your AWS Direct Connect connection with another AWS account, you can create a hosted virtual interface for that account. These hosted virtual interfaces work the same as standard virtual interfaces and can connect to public resources or a VPC. You are building a solution for a customer to extend their on-premises data center to AWS. The customer requires a 50-Mbps dedicated and private connection to their VPC. Which AWS product or feature satisfies this requirement? You can create an encrypted tunnel to VPC, but you don’t own the connection. Yes, it’s called Amazon Dedicated Connection. No, AWS only allows access from the public Internet. An organization has established an Internet-based VPN connection between their on-premises data center and AWS. They are considering migrating from VPN to AWS Direct Connect. Which operational concern should drive an organization to consider switching from an Internet-based VPN connection to AWS Direct Connect? AWS Direct Connect provides greater redundancy than an Internet-based VPN connection. AWS Direct Connect provides greater resiliency than an Internet-based VPN connection. AWS Direct Connect provides greater bandwidth than an Internet-based VPN connection. AWS Direct Connect provides greater control of network provider selection than an Internet-based VPN connection. Only when there’s just one availability zone in a region. If there are more than one, only one availability zone can be accessed directly. Modify the Instances VPC subnet route table by adding a route back to the customer’s on-premises environment. Your company previously configured a heavily used, dynamically routed VPN connection between your on premises data center and AWS. You recently provisioned a Direct Connect connection and would like to start using the new connection. After configuring Direct Connect settings in the AWS Console, which of the following options will provide the most seamless transition for your users? Delete your existing VPN connection to avoid routing loops configure your Direct Connect router with the appropriate settings and verity network traffic is leveraging Direct Connect. Configure your Direct Connect router with a higher BGP priority than your VPN router, verify network traffic is leveraging Direct Connect and then delete your existing VPN connection. Update your VPC route tables to point to the Direct Connect connection configure your Direct Connect router with the appropriate settings verify network traffic is leveraging Direct Connect and then delete the VPN connection. 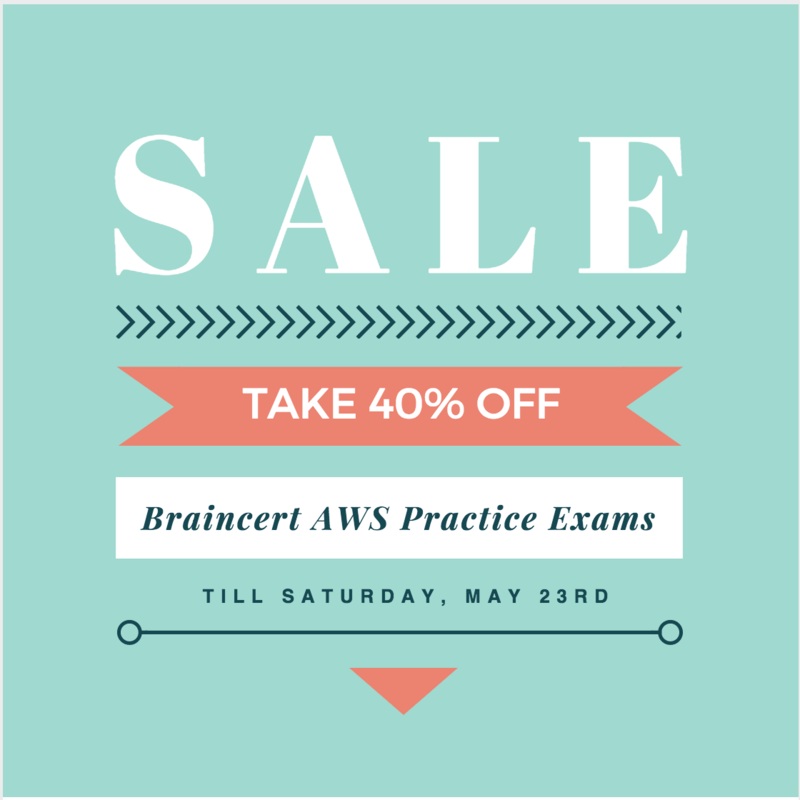 You are designing the network infrastructure for an application server in Amazon VPC. Users will access all the application instances from the Internet as well as from an on-premises network The on-premises network is connected to your VPC over an AWS Direct Connect link. How would you design routing to meet the above requirements? Configure a single routing table with a default route via the internet gateway. Propagate specific routes for the on-premises networks via BGP on the AWS Direct Connect customer router. Associate the routing table with all VPC subnets. You are implementing AWS Direct Connect. You intend to use AWS public service end points such as Amazon S3, across the AWS Direct Connect link. You want other Internet traffic to use your existing link to an Internet Service Provider. What is the correct way to configure AWS Direct Connect for access to services such as Amazon S3? Configure a public Interface on your AWS Direct Connect link. Configure a static route via your AWS Direct Connect link that points to Amazon S3. Advertise a default route to AWS using BGP. Create a private interface on your AWS Direct Connect link. Configure a static route via your AWS Direct connect link that points to Amazon S3 Configure specific routes to your network in your VPC. Create a private interface on your AWS Direct connect link. Redistribute BGP routes into your existing routing infrastructure and advertise a default route to AWS. 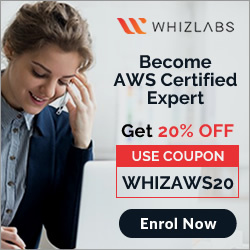 You have been asked to design network connectivity between your existing data centers and AWS. Your application’s EC2 instances must be able to connect to existing backend resources located in your data center. Network traffic between AWS and your data centers will start small, but ramp up to 10s of GB per second over the course of several months. The success of your application is dependent upon getting to market quickly. Which of the following design options will allow you to meet your objectives? Quickly create an internal ELB for your backend applications, submit a DirectConnect request to provision a 1 Gbps cross connect between your data center and VPC, then increase the number or size of your DirectConnect connections as needed. Allocate EIPs and an Internet Gateway for your VPC instances to use for quick, temporary access to your backend applications, then provision a VPN connection between a VPC and existing on -premises equipment. Provision a VPN connection between a VPC and existing on -premises equipment, submit a DirectConnect partner request to provision cross connects between your data center and the DirectConnect location, then cut over from the VPN connection to one or more DirectConnect connections as needed. Quickly submit a DirectConnect request to provision a 1 Gbps cross connect between your data center and VPC, then increase the number or size of your DirectConnect connections as needed. Can you explain why c is not the right answer for question #6? DirectConnect, by default, will have a higher priority. Do we really need to specify that? It has to be C, as per the videos in references no additional change needs to be for Direct Connect as compared to the Dynamic VPN routes. Although, i haven’t done any DX and VPN configuration and have not been able to find much documentation for the settings, the video being the major reference. would you clarify as i thought that last answer is the correct one since one will be through the internet “IGW” and other through the VPN ? specific routes to on prem subnets. Which technique can be used to integrate AWS IAM (Identity and Access Management) with an on-premises LDAP (Light Weight Directory Access Protocol) directory service? a. Use an IAM policy that references the LDAP account identifiers and the AWS credentials. b. Use SAML (Security Assertion Markup Language) to enable single sign-on between AWS and LDAP. c. Use AWS security Token Service from an identity broker to issue short-lived AWS credentials. d. Use IAM roles to automatically rotate the IAM credentials when LDAP credentials are updated. e. Use the LDAP credentials to restrict a group of users from launching specific EC2 instance types. You can use SAML Identity Providers in order to integrate IAM between AWS and on premise LDAP or federated SSO implementation. For example, you want to provide a way for users to copy data from their computers to a backup folder, in your organization. You build an application that users can run on their computers. On the back end, the application reads and writes objects in an S3 bucket but the users don’t have direct access to AWS. Instead, the application can communicate with an identity provider (IdP) to authenticate the user. The IdP gets the user information from your LDAP which is the organization’s identity store and then generates a SAML assertion that includes authentication and authorization information about that user. The application then uses that assertion to make a call to the AssumeRoleWithSAML API to get temporary security credentials. The app can then use those credentials to access a folder in the S3 bucket that’s specific to the user. I’m preparing for SAA exam and i have an exam next week. can you tell me last 4 questions are associate level or professional level?? options are confusing and difficult in my view. must be professional given the difficulty level ..
How to change the VGW associated with a Hosted Private Virtual Interface to a new Hosted Private Virtual Interface ?